Chapter XXIII. The Second Degree of Regeneration. RECALLING Chapter XXII, the present diagram will need but little explanation. 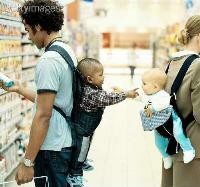 It represents man at the close of the second great step in regeneration. Dying at this stage he ascends to the spiritual or middle heaven. During this period man is brought into combat with deeper evils and falsities than in the first stage namely the evils and falsities of the second degree of the natural mind d and of the limbus f but he is sustained by more interior goods and truths in the second degree of the spiritual mind, a. Thus the second degree of the spiritual mind becomes founded on the cleansed and regenerate second degree of the natural mind and of the limbus. The middle degree of the natural mind is filled by an influx of good and truth from the middle degree of the spiritual mind and is conjoined to that degree and makes one with it. The interior seat of thought and affection and of spiritual power is now elevated into and fixed in the middle degree of the spiritual mind. Here also conscience holds its interior seat; its exterior seat being in d.
The warfare against the evils of the middle degrees of the natural d and f, causing their removal, was not carried on by the goods and truths of the spiritual mind directly upon those evils but through goods and truths stored as remains in the natural. 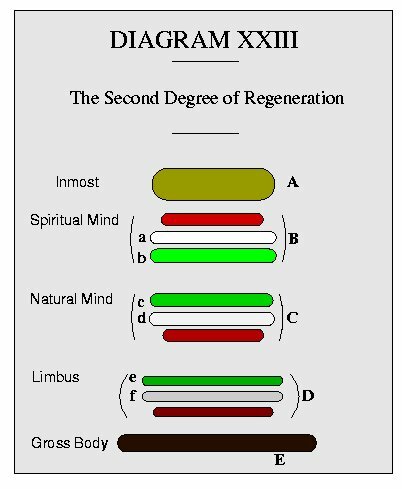 When the regenerate man rises after death into his appropriate heaven are his lower degrees elevated into that higher plane? No. -His lower degrees necessarily remain in their proper planes with which they agree in substance, structure and quality. These are conjoined with and quiescent under the higher. Nevertheless the man, now an angel, appears in the higher plane opened for his conscious enjoyment. Opening a higher or a lower degree in an angel or a spirit causes his appearance in that degree, and closing the degree causes his disappearance. So it is that angels and spirits ascend and descend on that great Ladder (or way with steps) within themselves which was set on the earth with its head reaching to heaven. With the wicked the natural degrees are closed above and opened below. In the good those degrees are open above and closed below. These opposite states cause separation and cause the good to appear above and the evil below. This with change of locality by change of thought, answers the question on page 59. Previous: Chapter XXII. Adult Life. – First Degree of Regeneration. Up: Discrete Degrees Next: Chapter XXIV. The Third Degree of Regeneration.